High-end graphics cards are highly coveted and look awesome! Unfortunately, traditional installation of these cards often means pointing the artwork in the wrong direction. 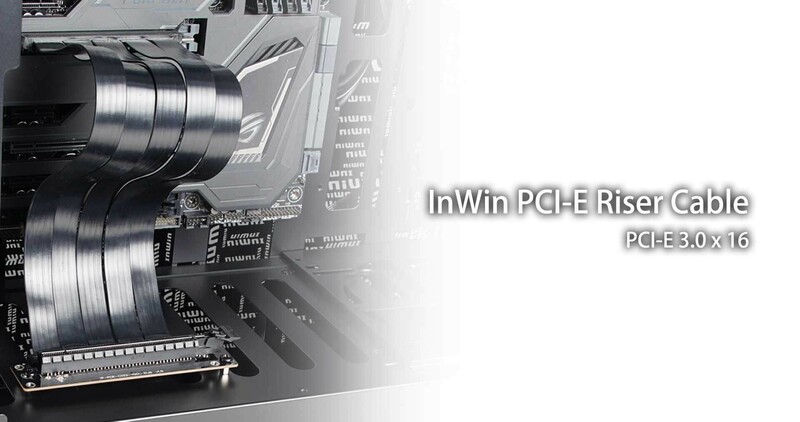 InWin’s PCI-E 3.0 X16 riser cable allows users to connect graphics cards vertically to the mainboard and nicely showcase it. This riser cable is fully compatible with Intel and AMD platform motherboards and can be installed in any chassis on the market. This PCI-E riser cable can be used to mount a PCI-E X16 card in a wide variety of situations. It is especially suitable for custom enclosures and low-profile rack-mount chassis. The InWin PCI-E riser cable is flexible, highly routable and can be positioned in any suitable direction. New layout PCB board design with high speed cable. To get PCI-E 3.0 bandwidth, please ensure to plug the PCI-E cable into the PCI-E 3.0 X16 interface. Please ensure no shorts have occurred due to poor PCI card placement. To prevent from damaging the cable, please do not fold the PCI-E cable during installation.